Looking back at Vatnajökull on the way down. Perfect weather, from what I understand, doesn't happen often in Iceland. Getting a bluebird day with no wind or rain is rare, and for most of the week we spent there, I was in a combination of my down jacket, hat, gloves, and rain jacket. But sometimes, things just work out, and you get as lucky as you can get. The rain stops, the clouds part, the wind dies down, and some of the most fascinating and awe-inspiring landscapes you can possibly imagine are revealed. 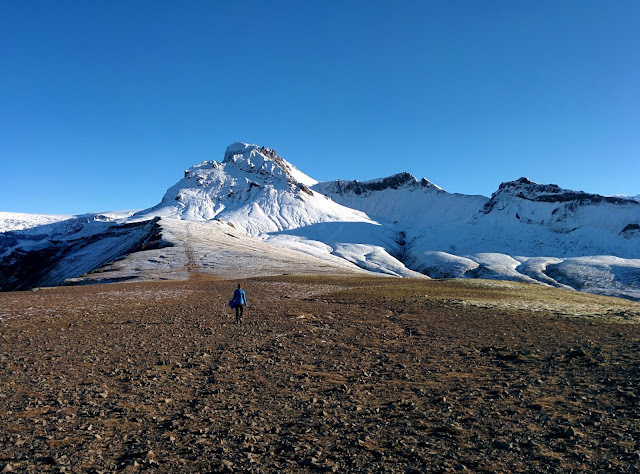 On our only full day in Skaftafell/Vatnajökull National Park, that's exactly what happened. One of the few hikes I found in advance of our recent trip there was a scramble up a rocky, scree-covered ridge in the park - Kristínartindar. Scree scrambles aren't my favorite, but the photos of the views made it impossible to resist. My fiance and I decided we'd give it a go. The bonus? We'd pass by one of the most unique waterfalls on our trip - Svartifoss. If you're completing the full loop, to Kristínartindar, it's a bit over 11 miles round trip. Regardless of which direction you do the loop in, you'll start at the Skaftafell Visitor Center. We spent the night before our hike in the campground there and hopped out of our Campeasy van early in the morning to start our hike. We'd read if the weather's good, doing the loop counter-clockwise is recommended because you're staring at Vatnajökull, a massive glacier, the entire time. We opted to go clockwise, visiting Svartifoss first. The trail to Svartifoss is extremely well marked, and it almost felt like a paved walking path thanks to erosion mats placed to keep the trail from washing away. We could walk side by side all the way up, which was a nice way to start the day. After 1.5km of walking uphill along the path, we came to Svartifoss, which directly translates to Black Falls. Though it's only 12m tall, the basalt columns, green moss, and beautiful cascading water made for one of my favorite sights on our trip. The hexagonal columns break off regularly, from what we learned, and there were plenty of other visitors who'd also made the early trip up to the falls, making staying on the trail especially important. We crossed the bridge below Svartifoss to continue our hike, heading up another 0.4km to Sjónarsker to find what we learned is called a "view dial." The view dial showed the name of nearby peaks and mountains, and it was neat to understand exactly what we were looking at. 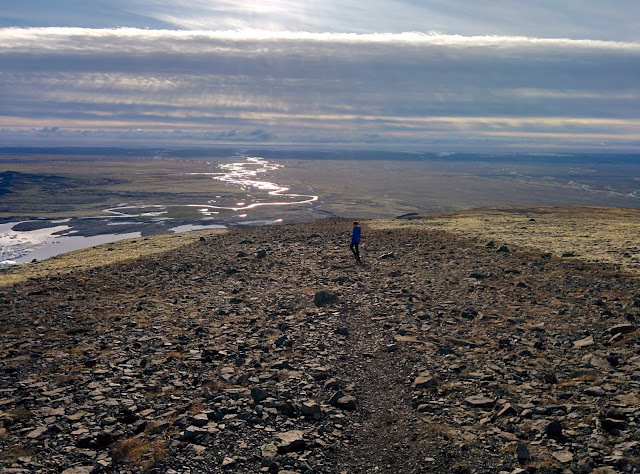 At that point, we opted to continue forward toward Kristínartindar, which we could clearly see from several kilometers away, thanks to the lack of trees and incredible weather we had. 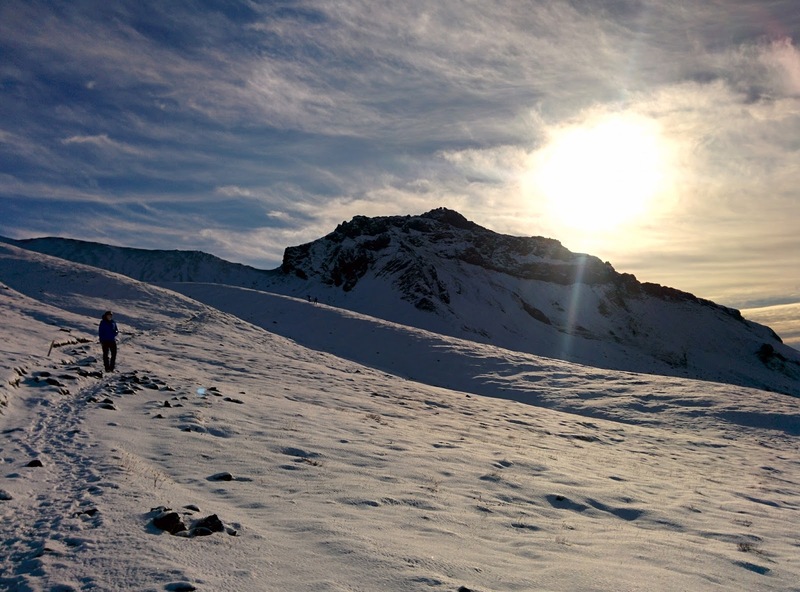 It also became obvious we'd have some snow to content with on the loop, and we talked about how we'd determine whether it felt safe continuing on without crampons or other snow gear. Along the way, small wooden stakes with yellow blazes painted on them kept us on track. The often wet, muddy trail was easy to follow until we got to the section recently covered with snow; even then, other hikers left footprints behind in the fluffy white powder. We had the trail to ourselves, save two brothers from Spain we met on the way up. We leapfrogged with the brothers all the way up to the base of the ridge to a sign post indicating it was time to make a choice. At that point, I was starting to get nervous about the terrain, knowing we didn't have hiking poles or any traction devices for our boots. 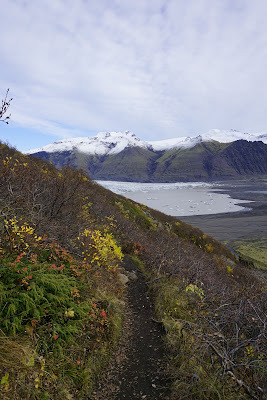 The primary reason for heading up the ridge would've been to get a better view of Vatnajökull (literally water glacier), but the brothers told us they knew the view would be comparable if we just completed the loop without the climb. Between knowing we'd still get the view without the ridge scramble, the perceived risk, and our dwindling snack supply, we opted not to hike an additional 1.4km up Kristínartindar. Instead, we took the 8.6km trail heading back down toward the visitor center as we watched the brothers head up the ridge. The point where we made our choice not to head up any further, which I don't regret at all! As we rounded the ridge and the brothers disappeared from view, we got a chance to look back at where we came from, and eventually, Vatnajökull came into view. 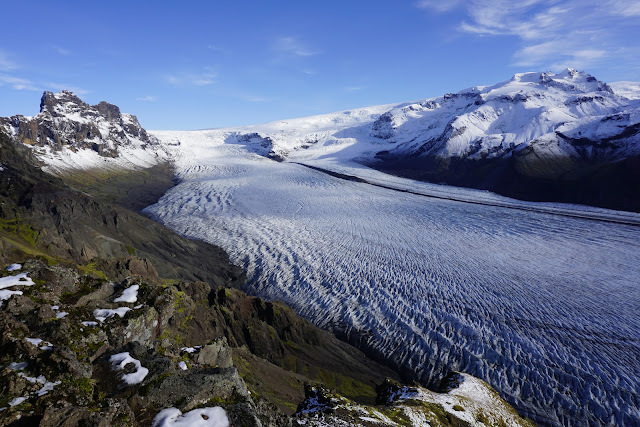 I've seen glaciers before, and we saw them all the way across the southern part of Iceland heading toward Skaftafell/Vatnajökull National Park. But every time one was visible on the horizon, I was absolutely mesmerized. 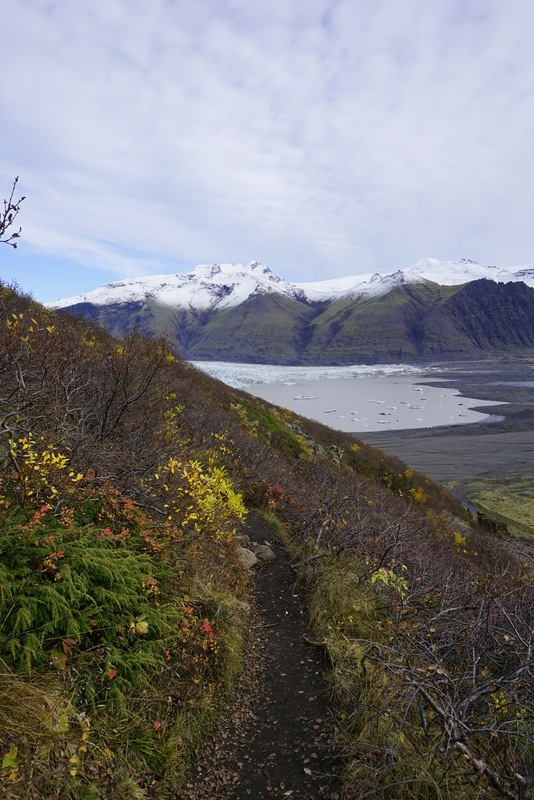 And now, we'd hiked ourselves to cliffs above the tongue of the largest ice cap in Iceland. The complete absences of clouds, wind, and rain meant sitting staring at the glacier for as long as we wanted to. 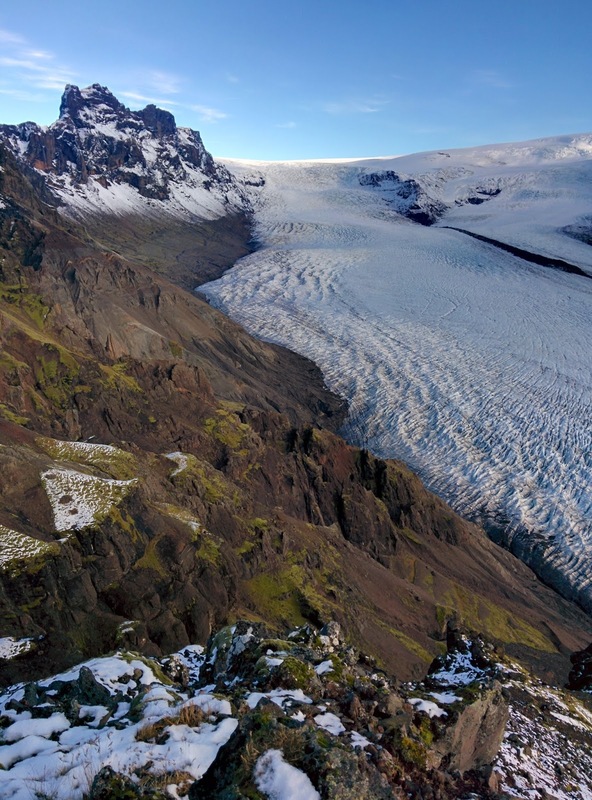 My rumbling stomach quickly got the best of me, but for the majority of the hike back down to the visitor center, we had views of Vatnajökull, the glacier tongue, and the ocean. Yep, not a bad view, is it? We picked our way down the trail, following the little wooden stakes. After making our way off the snow-covered portions, we found ourselves on slices of flat, smooth rock. The going was a bit slower as we found our footing, and we saw a handful of hikers making their way up toward us. I couldn't believe how, with weather like that, the trail wasn't absolutely mobbed. As the visitor center came into view, we searched the landscape for the campground and found our little van. The entire round trip took us about five hours, and my estimated mileage was around 18km (11 miles) total. Looking back up the trail on the way down. I wished we'd had a chance to stop in the visitor center because we didn't have a detailed map, but it closed before we arrived the night before our hike and opened too late for us to wait to go the morning of. Luckily, the sign posts were descriptive enough and the trail was easy to follow, so we didn't have any trouble. I'm not sure what the trail looked like beyond what we could see on Kristínartindar, so if you're going to do this hike, I'd get a map first. The beginning of the trail was muddy, the middle was covered in an inch or two of snow, and the end was rocky and unstable. 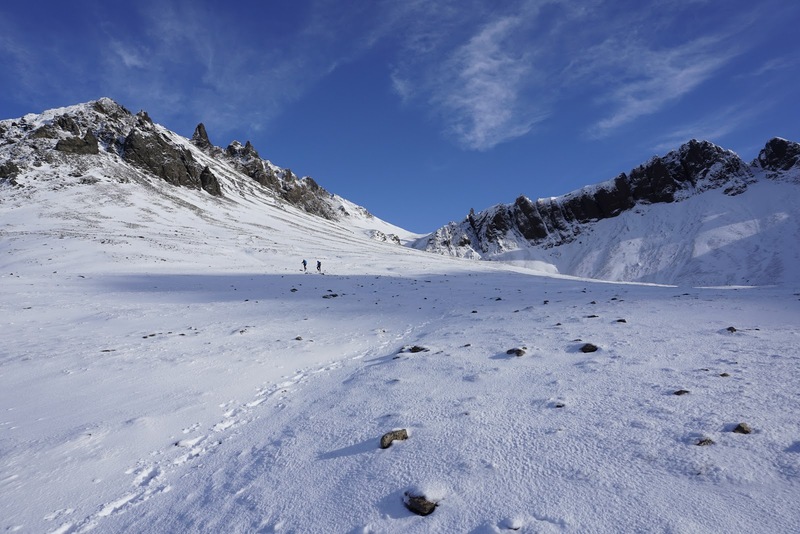 Wear sturdy shoes, but if you're a seasoned hiker, this hike is absolutely do-able even if there's a little snow on the ground. Bring traction devices if you're going any time after September, just in case. The parking lot at the visitor center requires paying a fee, and as we'd paid for camping the night before, we just left our van where it was and made our way back to it when we were done. But be prepared to pay to park. We also saw a ton of unused overflow parking; if you're there during the busy season, I'd imagine the parking lot gets pretty full. Though the recommendations I'd read were to do the loop counter-clockwise if it's a nice day so you'll see the glacier your entire hike up, we got lucky with good weather all day and it was spectacular either way. Most hikers we saw opted to go counter-clockwise. Have you done any hiking in Iceland? 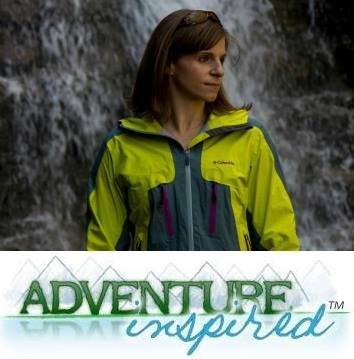 What hikes did you do? 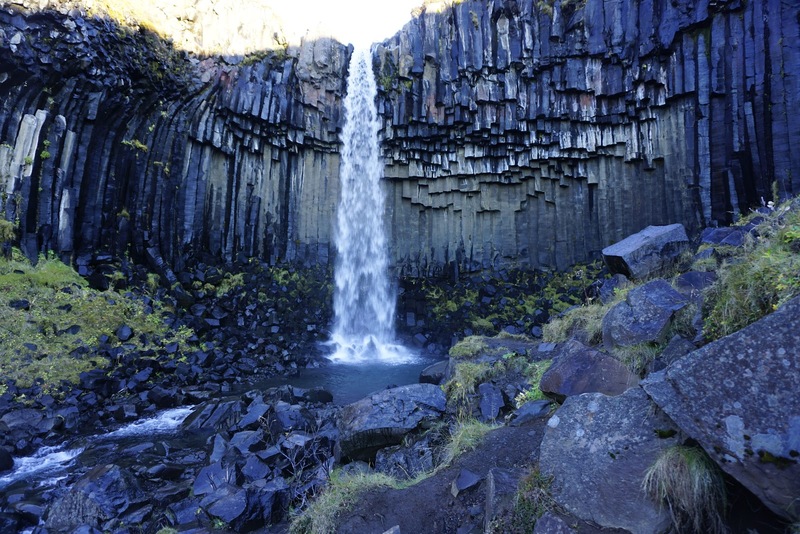 Have you done this one, or been to Skaftafell National Park? I'd love to hear from you in the comments! Holy s**t! I was in Iceland last year and I've never even thought about hiking on that rock and mountains. beautiful views and photos.